Since I started working out intensely, I sometimes feel a little low on energy especially after my early morning workout before my infant daughter Aria wakes up. 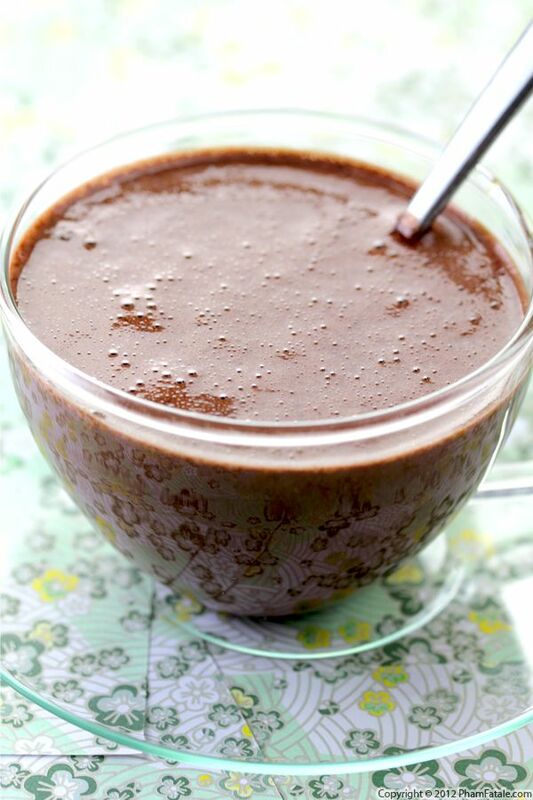 I've tried some of the commercially available protein drinks, and a few are ok, but when I have the time I make an almond chocolate drink. It's made of homemade toasted red rice powder (I've mentioned it in the past), ground almonds, almond milk, unsweetened cocoa powder and a natural sweetener. I usually pour it in a travel mug and enjoy it in the car later in the morning. It's thick, nutritious and extremely filling. I'm usually less hungry at lunch time so a light salad is more than enough to stay satisfied until dinner. I'll share more of the flavors I've developed soon. These drinks have become my grab-and-go "breakfast," once my little Aria wakes up and keeps me busy for the rest of the day. I'm no dietitian or medical expert, but I've noticed a boost of energy and I eat a lot less when lunch time comes. Kheer is saffron-flavored rice pudding. The difference from the Western version is that the ratio of rice to milk is a lot lower. Only a few handfuls of rice grains are needed. The rice is simmered in a large quantity of milk until the grains burst and become very starchy. Add a little sweetener and the dish is almost done. The last touch is saffron, which gives that beautiful yellow hut to the rice pudding. Chè chuối is a popular dessert from South Vietnam, where my parents are from. 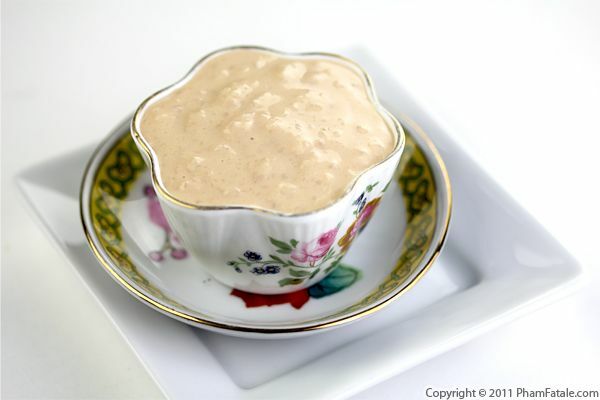 Bananas are simmered whole until softened in a coconut milk tapioca pudding. 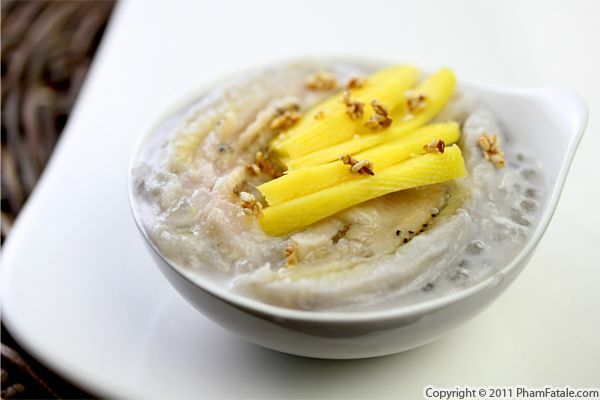 It takes less time to prepare than Western desserts, plus chè chuối is made exclusively with vegan ingredients. If you like Vietnamese desserts or Vietnamese sweets in general, you've probably noticed they don't always have the nicest presentation, especially chè desserts. They often have a very neutral, grayish color and soupy texture. If you get past that, you're guaranteed to at least get a completely fresh take on dessert. Unless you’ve been under a rock, you’ve probably been inundated with news about the pending royal nuptials. And even though I already had mine years ago, I am a sucker for fairytale weddings. Food is one of the keys to an amazing event, and since banana flan ("banana cream pie" in America) is Prince William's favorite dessert, I made half a dozen of them so the 6 girls in our family can nibble while watching the wedding on TV. 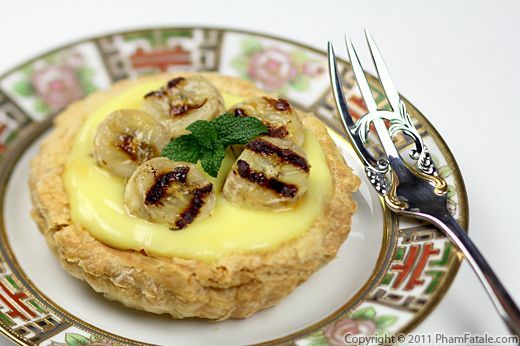 The recipe is pretty simple; I made puff pastry pie shells that I filled with regular custard that I filled in and topped with grilled bananas. The flavor is very similar to banana pudding, which is definitely nothing to complain about. I adapted the recipe from Chef Darren McGrady's Eating Royally. Chef McGrady was the personal chef to Prince William, Prince Harry and Lady Diana until her death in 1997. I'm going to try my hardest to watch it live, but I’m not sure I'll be able to stay up so late. One thing I do know is that I'll be enjoying banana flan and hot tea (oh so British!) while staring at Kate Middleton's wedding gown and waiting for the couple's smooch from the balcony of Buckingham Palace. The last time I made mango rice pudding, the little one of the family (she's only 6 years old) complained that she didn't get any. I promised her I'd make some more the following day but I kept forgetting. 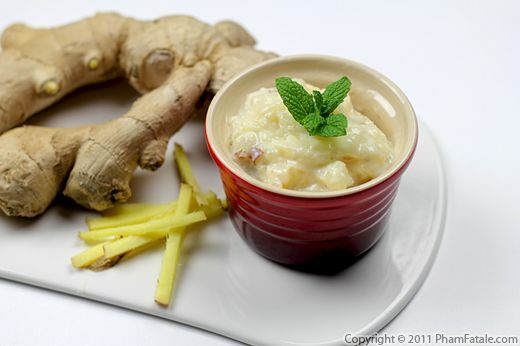 I finally had time to make some rice pudding today, which I flavored with fresh ginger. Ginger is a very versatile ingredient that can flavor either drinks, savory dishes or desserts. If you want to serve this at the end of a dinner party, I would recommend using tuile bowls filled with a layer of ginger chocolate mousse and topped with the ginger rice pudding. It's a great way to serve traditional family desserts and turn them into elegant desserts. In case you were wondering, I made sure everyone got their fair share of rice pudding this time. That means I’m going to have to find a new excuse the next time I have a craving for rice pudding!